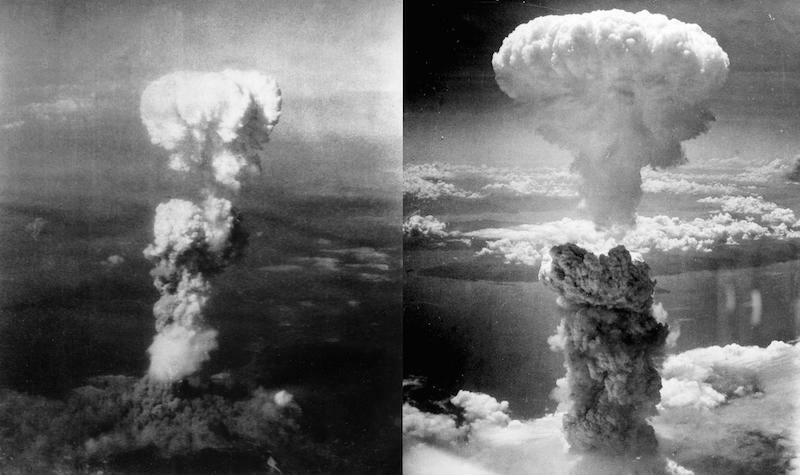 Mushroom clouds which formed in the aftermath the Hiroshima bomb (left) and Nagasaki bombi(right) . 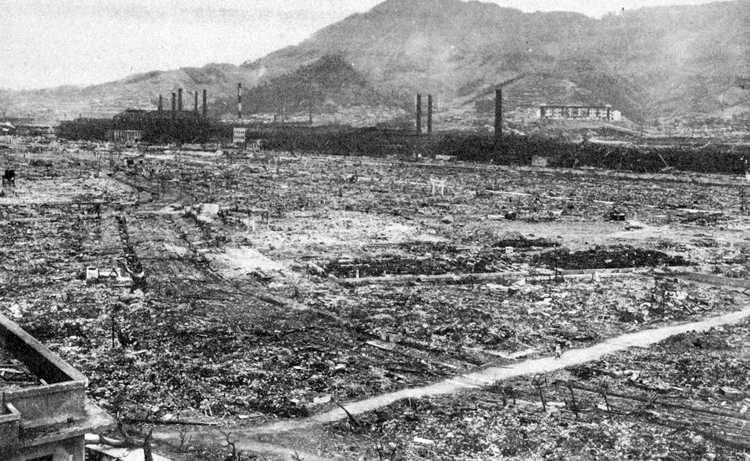 General panoramic view taken from the Nagasaki Medical School and Hospital, looking southeast. The detonations of the atomic bombs over the cities of Hiroshima and Nagasaki, Japan constitute the greatest war crimes of the modern era. Neither nuclear attack was legally defensible or lawful by any standard. Nor were those atomic bombings ethically sound or morally justified in any way. In short, both episodes of nuclear annihilation were acts of naked aggression and unjustifiable violence against innocent civilian populations. Just as importantly, both war crimes were completely unnecessary as they were (i) perpetrated as mere experiments by the U.S. scientific and military establishments, and (ii) meant to deliver a global message from the U.S. government and political class. One of the most significant messages was directed at the Soviet Union. In the wake of World War II there would be a New World Order (NWO) established and the United States of America would operate as the military arm of that NWO. The highest ranking U.S. officials and military personnel responsible for those 2 atrocities carried out against defenseless and powerless Japanese civilians include President Harry S. Truman, Secretary of War Henry L. Stimson, Chief of Staff of the United States Army and General of the Army George Marshall, and the Army Commander-in-Chief in the Pacific and General of the Army Douglas MacArthur. These are the BIG 4 without whose approval neither atomic bomb would have been dropped on Japan. The two operational generals who ushered this unparalleled massacre to its completion were Major General Curtis LeMay and Major General Leslie R. Groves, Jr. It should be noted that Groves was determined throughout the target selection phase to drop an atomic bomb on Kyoto, a metropolitan area with one of the largest civilian populations in Japan. On May 30, Stimson asked Groves to remove Kyoto from the target list, but Groves pointed to its military and industrial significance. Stimson then approached President Harry S. Truman about the matter. Truman agreed with Stimson, and Kyoto was temporarily removed from the target list. Groves attempted to restore Kyoto to the target list in July, but Stimson remained adamant. General Groves was also intent on dropping additional atomic bombs on Japan, even after the first two had produced so much carnage and widespread destruction. Groves expected to have another atomic bomb ready for use on August 19, with three more in September and a further three in October. On August 10, he sent a memorandum to Marshall in which he wrote that “the next bomb … should be ready for delivery on the first suitable weather after 17 or 18 August.” On the same day, Marshall endorsed the memo with the comment, “It is not to be released over Japan without express authority from the President.” Truman had secretly requested this on August 10. This modified the previous order that the target cities were to be attacked with atomic bombs “as made ready”. The Target Committee also include Major John A. Derry, Colonel William P. Fisher, Joyce C. Stearns and David M. Dennison from the USAAF; and scientists John von Neumann, Robert R. Wilson and William Penney from the Manhattan Project. Others involved with the Target Committee include Commander Frederick Ashworth from Project Alberta and the Manhattan Project’s scientific advisor, Richard C. Tolman. 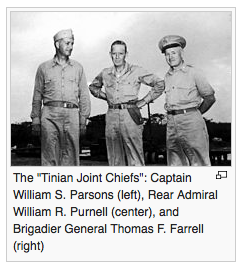 The “Tinian Joint Chiefs” at the time were Captain William S. Parsons, Rear Admiral William R. Purnell, and Brigadier General Thomas F. Farrell. Each of them played key operational roles in the Pacific theatre of war where the atomic bombs would be deployed from and eventually dropped by specially outfitted B-29s. Orders for the atomic bomb attacks were each issued to General Carl Spaatz on July 25 under the signature of General Thomas T. Handy, the acting Chief of Staff. The individuals responsible for the actual flying missions which committed these unprecedented war crimes against Hiroshima and Nagasaki are listed respectively as follows. In the case of both nuclear attacks the flying missions involved multiple aircraft which performed weapon delivery, weather reconnaissance, blast measurement instrumentation, and strike observation and photography. That completes the summarization of the highest ranking personnel directly associated with the actual dropping of the bombs. Only because the victors of every war get to write the history books were these men not prosecuted as the Nazis were at the Nuremberg war trials. After all, their nuclear attacks on civilian centers was as gross a violation of international law and generally accepted moral code as any war conduct by Axis powers. In fact, the dropping of those two atomic bombs was much worse than anything ever done by Japan or Germany. The preceding lists of U.S. military personnel do not include the hundreds of scientists and civilian administrators who worked on the Manhattan Project. Many of the world’s most famous scientists were deeply involved in the quest to develop the first atomic bomb. Robert Oppenheimer, David Bohm, Leo Szilard, Eugene Wigner, Otto Frisch, Rudolf Peierls, Felix Bloch, Niels Bohr, Emilio Segre, James Franck, Enrico Fermi, Klaus Fuchs and Edward Teller. On August 8th of 1945, the Soviet Union officially declared war on Japan, pouring more than 1 million Soviet soldiers into Japanese-occupied Manchuria, northeastern China, to take on the 700,000-strong Japanese army. The USA absolutely did not want to share Japan with the Russians the way that Germany was split into East and West. The mutual distrust between the American and Soviet leaderships was growing by the day. Coincidentally, or perhaps not, the second atomic bomb was dropped on Nagasaki the day after the Soviet Union formally declared war on Japan. 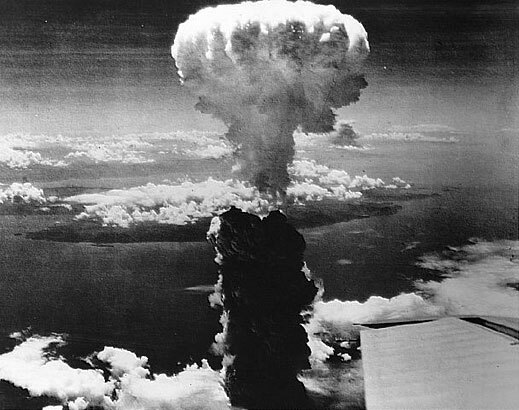 It has been suggested that the second objective [of the atomic bombings] was to demonstrate the new weapon of mass destruction to the Soviet Union. By August 1945, relations between the Soviet Union and the United States had deteriorated badly. The Potsdam Conference between U.S. President Harry S. Truman, Russian leader Joseph Stalin, and Winston Churchill (before being replaced by Clement Attlee) ended just four days before the bombing of Hiroshima. The meeting was marked by recriminations and suspicion between the Americans and Soviets. Russian armies were occupying most of Eastern Europe. Truman and many of his advisers hoped that the U.S. atomic monopoly might offer diplomatic leverage with the Soviets. 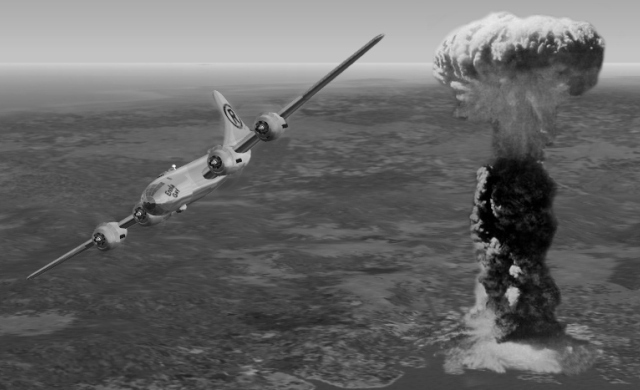 In this fashion, the dropping of the atomic bomb on Japan can be seen as the first shot of the Cold War. It has been speculated that President Truman was goaded into both nuclear attacks by those advisors who were determined to plunge the whole world into a Cold War. In retrospect, the use of such powerful nuclear weapons so close to the borders of the Soviet Union served to seal the “Cold War” fate of the world for much of the remaining century. Nations everywhere were forced to consider the potential consequences which accompanied the only effective nuclear containment policy known as MAD or Mutually Assured Destruction. The original desire of the United States government when they dropped Little Boy and Fat Man on Hiroshima and Nagasaki was not, in fact, the one more commonly known: that the two nuclear devices dropped upon Hiroshima and Nagasaki were detonated with the intention of bringing an end to the war with Japan, but instead to intimidate the Soviet Union. The fact of Japan’s imminent defeat, the undeniable truth that relations with Russia were deteriorating, and competition for the division of Europe prove this without question. The US Government wanted nothing less than a full unconditional surrender by the Japanese at the end of WW2. They were determined to extract this concession from both the Japanese military and monarchy any way they could. Just as the Allied forces ruthlessly firebombed Dresden and other German cities toward the end of WW2 in order to make Germany as compliant as possible in their surrender, the two atomic bombs served the very same purpose with Japan. In this way both nations — Japan and Germany — would be occupied for several decades, as they still are today, as per the terms of their respective surrender agreements. Likewise, they have both served as vassal states to their conquerors. Unknown to most, they have essentially functioned as slave colonies under the guise of economic rejuvenation and subsequent national rehabilitation. In reality Japan and Germany are completely controlled by their American and European overlords, although that true state of affairs is rarely, if ever, revealed. The current Okinawa Governor pledged to remove the U.S. military base from the island and was elected because of that specific campaign promise. Not only has that not yet happened, or likely to happen, the federal government in Tokyo has improperly weighed in on the matter. It appears the base will only be moved to a different location in spite of the vast majority of Okinawans wanting it gone from the island … forever. Such is the power of the American military in the affairs of Japan up to this very day. Furthermore, as China has become a major economic powerhouse and has begun flexing its muscles, Japan has been pushed by its American overseers to arm itself in order to offer military support of U.S. hegemony throughout the Asia Pacific region. Contrary to their current Constitution, which was imposed by the U.S., Japan is being coerced by the same nation to abandon the peaceful and defensive posture it has assumed since WW2. Article 9 of the 1947 US-imposed Japanese Constitution outlaws war as a means to settle international disputes involving the state. In its text, the state formally renounces the sovereign right of belligerency and aims for international peace based on justice and order. Likewise, Germany has frequently been called upon by the U.S. government and NATO to participate in various acts of war, as well as the policing of war zones created by the Anglo-American Axis (See glossary below). Chancellor Angela Merkel has apparently given in to all sorts of illegal and treasonous requests by Washington to spy on the German government and select corporations. Although she herself has been spied on by the NSA, she responds to each outrageous act of illicit surveillance with virtually no substantive action whatsoever … not even engaging in the expected lip service to her various constituencies. Such is the influence of her American masters in the affairs of the German state up to this very day. Above all else, the highly destructive and dramatic explosions of two atomic bombs over Japan have serve as a stark reminder to the whole world that the USA is the self-designated global policeman. Acting with shocking brutality and cold-blooded murder, just as the streets of America frequently demonstrate, the USA has boldly asserted itself as the “Military Arm of the New World Order“. It is extremely important to understand by the world-at-large, that the inaugural act of this global geopolitical reality was the utterly savage and wanton destruction of Hiroshima and Nagasaki. The profound damage wrought on Japan with the dropping of those two atomic bombs has been etched into the collective psyche of humankind . 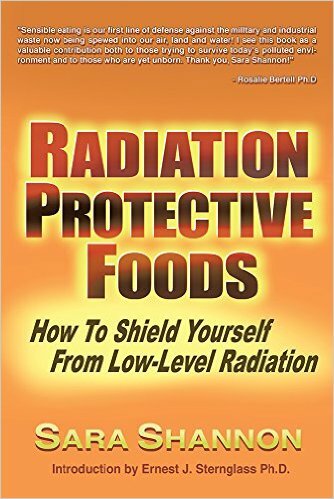 Never in history have such acts occurred which instantly vaporized so many human beings, and consigned so many others to horrible deaths by way of radiation sickness and poisoning. This is why America will never apologize for those egregious crimes against humanity and the people of Japan. It was meant to be a glaring crime against humanity in order to deliver a message that would never be forgotten. Both atomic bombings are also considered to be crimes against humanity because of the nuclear fallout which has certainly traveled around the world affecting people everywhere to varying degrees. Such is the raw power and military prowess that the USA wanted to convey to the community of nations by such heinous acts of destructive violence. The message from TPTB, simply put, is that anyone who messes with the USA will be toast, figuratively and literally. Just look at the post-apocalyptic wasteland that the Middle East “Armageddon” has since become with every single act of U.S. military aggression, by U.S. warmongering surrogates and U.S. militant proxies. To Shock and Awe was the real purpose of both Hiroshima and Nagasaki. Each act of inhuman barbarity has been seared into the national consciousness of Japan, just as they have been indelibly imprinted in the minds of the rest of humanity. People everywhere have been falsely led to believe that it was necessity which compelled the USA to drop two atomic bombs on Japan in order to prevent ‘millions’ of predicted wartime deaths on both sides. In fact, Japan was already sufficiently softened up by so many military losses and had made genuine overtures to surrender. Nonetheless, the United States wanted nothing less than an unconditional surrender by which they could foist their will over all of Japan … which is exactly what they have done since 1945. This little known fact is directly responsible for so many Japanese governments coming and going, especially over the past couple of decades. 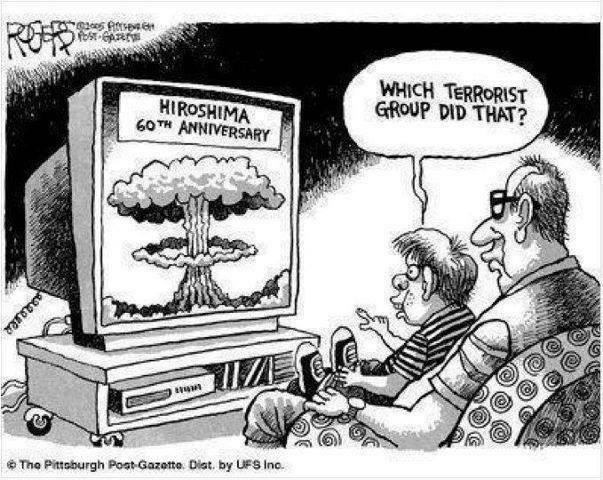 Very few are aware that the two atomic bombs dropped on Hiroshima and Nagasaki were quite technologically different from each other. The following description explains just how different they were. Two types of bombs were eventually devised. The Hiroshima bomb, known as a Little Boy, was a gun-type fission weapon that used uranium-235, a rare isotope of uranium extracted in giant factories at Oak Ridge, Tennessee. 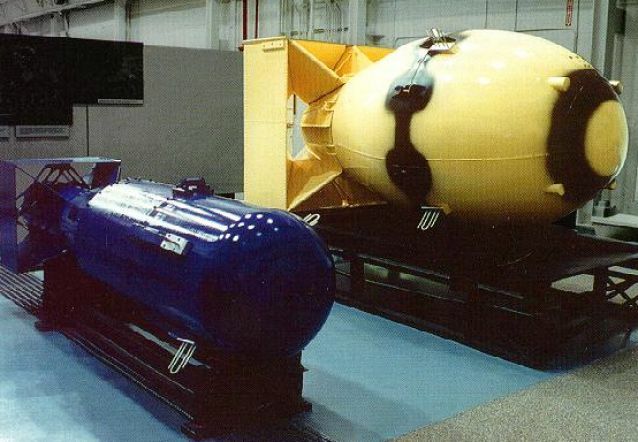 The other was a more powerful and efficient but more complicated implosion-type nuclear weapon using plutonium-239, a synthetic element created in nuclear reactors at Hanford, Washington. They were so technically different, as the above excerpt indicates, that the concerned scientists and military men wanted to know which would be more effective in practical use. Hence, the cruel and calamitous decision to bomb a second Japanese city was taken. This is what happens when scientists without conscience collaborate with military types who accrue way too much power during wartime. The Japanese will, one day, wake up to the fact that the Fukushima nuclear catastrophe was yet another example of outright dictatorship by the USA. By foisting their G.E. nuclear reactors on the four main islands of Japan, they put the entire nation in extremely serious jeopardy. How else could the real American masters run the factories in a nation that woefully lacked other sources of energy? The 20th century plantation set up in Japan would not be allowed to lie idle. Toward that end, TPTB sited 55 nuclear reactors along the coastlines of Japan, the most seismically active islands in the world. 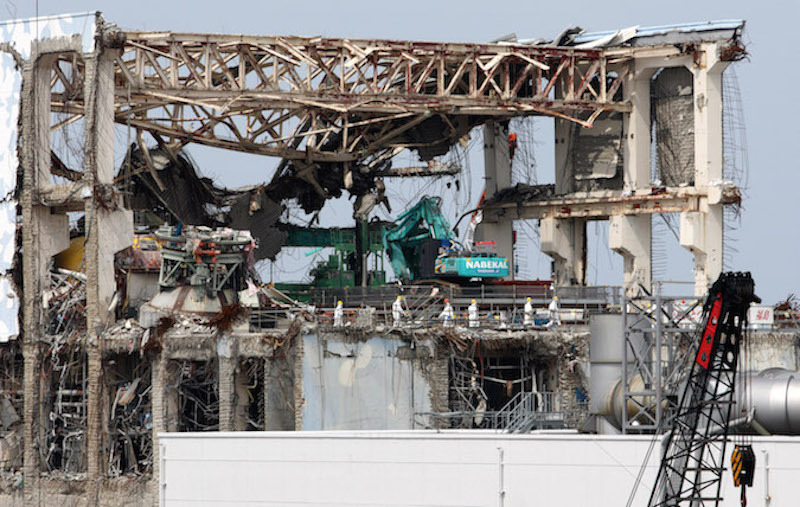 In so doing, both TEPCO and the Japanese government exposed the country to the whole specter of nuclear disasters which can occur in the wake of 11.0 earthquakes and 45 foot high tsunamis, as well as category 5 typhoons and cyclones. Such a daunting and dangerous scenario has played out in Fukushima since 2011, and can reoccur in Japan at anytime as long as their nuclear power plants remain in operation. 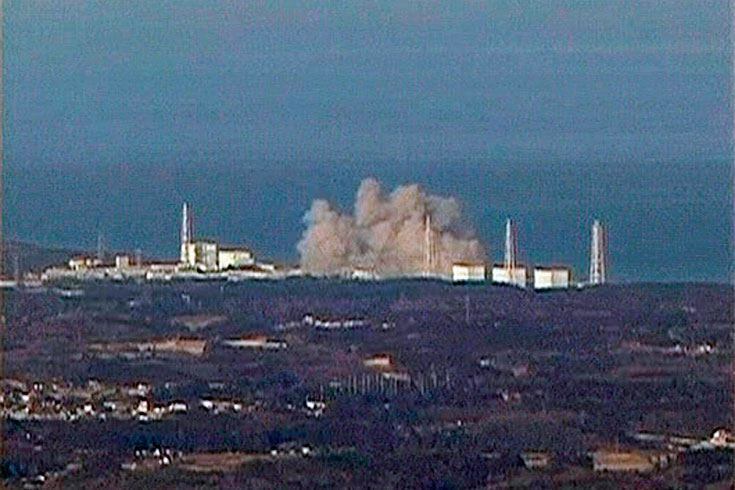 Japan should never have sited 55 nuclear reactors (plus 12 others) on its coastlines. Which begs the question: Why did they? The USA aggressively imposed a nuclear power generation model throughout Japan because they did not want them to purchase oil and gas from Russia. That particular trade relationship was to be prevented at all costs in the minds of the American capitalists. And so it was … to the great detriment of the people of Japan. The highly organized U.S Federal Government conspiracy behind these two atrocious crimes against humanity are only equaled by the depth and breadth of their subsequent coverup. For it was the extremely complex and coordinated coverup which has allowed the perpetrators to escape both judgment and punishment since 1945. At the risk of sounding redundant it is very important to understand that it is the critical and crucial message to the entire planetary civilization which was central to the U.S. war agenda. That message was simply that whoever possesses the most destructive weaponry rules the realm. And so it came to pass that the USA was ‘appointed’ sole superpower of the planet. Not only was there no need for one nuclear attack since Japan was in the process of surrendering, the second atomic bomb was dropped to show the whole world that America had become power-mad enough to “press the button” anytime, anywhere they chose to. Therefore, the necessity to maintain the appearance of propriety by the USA concerning these obvious war crimes became the central organizing principle for the greatest propaganda campaign in world history. Only through an unrelenting and highly sophisticated propaganda campaign was the USA able to convince the world community of nations that it would be a good global policeman. Not only is the United States the only nation to have used nuclear weapons on civilian population centers, their military continues to utilize depleted uranium-containing weapons all over the various battlefields throughout the Middle East. The USA has, in fact, proven to be the most irresponsible and reckless with regard to the outworking of their nuclear energy paradigm. Such is their capacity for deceit that this multi-decade deception (aka USA propaganda campaign) has been extremely effective at mind-controlling the masses around the globe. 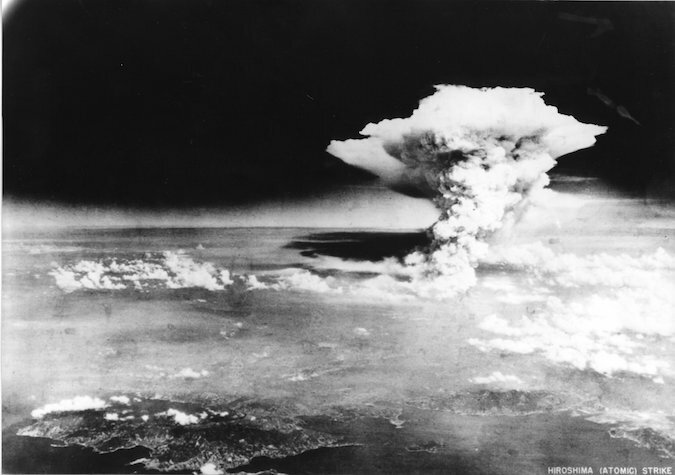 A majority of people worldwide still honestly believe that the two atomic bombs were totally justified. It’s as though the Madison Avenue PR campaign implemented via the Mainstream Media and Motion Pictures, book publishing and school curricula has been successful well beyond the perpetrators goals … especially given the ghastly nature of such a hideous crime. The United States of America will inevitably be compelled to sincerely apologize to the people of Japan for those horrendous war crimes. Their profoundly misguided nuclear attacks on civilian centers will become known as “the greatest war crimes in modern history”. The USA will also be compelled to make material amends for such odious crimes. Only the when and how remain to be revealed. 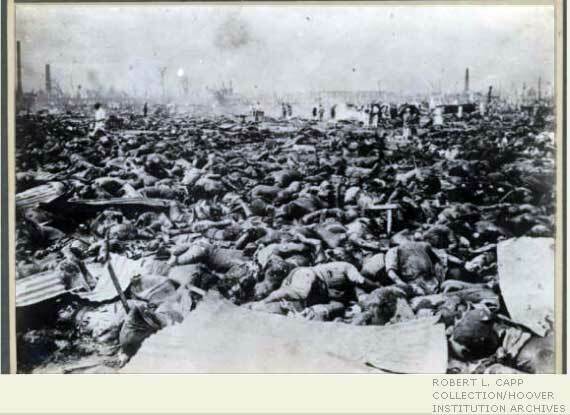 One day, in the not-too-distant future, America will be sufficiently humbled that the nation will ask for forgiveness for treating the people of Japan with such cruelty and disdain. When the upcoming generations in the USA have been adequately enlightened about the true purpose of the atomic bombings, they will reel in horror. They will then apologize with genuine remorse for the actions of the U.S. Federal Government of 1945 over which they had obviously no control, nor had any relationship with. We hope and pray that the people of Japan will have the generosity of spirit to offer the extraordinary forgiveness that such a serious and unsurpassed transgression demands. The author of this open letter was chosen by his 5th grade teacher to participate in a debate and assigned to speak on the 3-person panel in favor of dropping the atomic bombs on Japan during WWII. This teacher was quite perceptive and knew that the pro-bombing panel would win the debate, which we did, because of my ability as a persuasive wordsmith and ‘accomplished’ debater. However, relishing the quickly forgotten victory soon gave way to a sense of deep regret. Having advocated a cruel and heartless position that was completely contrary to my conscience, my moral upbringing and my very being, I began to experience a knawing remorse. From that day forward when the awareness set in that, through my own post WW2 behavior and views, I, too, became complicit in one of the greatest misdeeds of all time, I vowed to look for any opportunity to right this wrong. I pray that I have done just that through the posting of this essay, as well as this previous open letter. The question remains about why the USA was so intent on short-circuiting the natural energy trade relationship that would occur between Soviet Union and Japan post WWII. The oil and gas-rich USSR could have easily accommodated Japan’s urgent need for energy sources. After all, the distance from Sapporo, Japan located on the island of Hokkaido is only 280 miles from mainland Russia. The Russian island of Sakhalin is even closer to Hokkaido at a mere distance of 45 miles. Unknown to most, this particular issue was the very reason that Japan entered the World War II in the first place. The Allies had so effectively prevented Japan from receiving vital oil and gas supplies that the Japanese perceived their worsening circumstances as an existential threat. The U.S. military had effectively blockaded Japan from receiving direly needed oil and gas from their traditional suppliers. By so controlling Japan’s future destiny with their unconditional surrender, the USA was able to strictly dictate the nation’s energy policy. Toward that end the American agenda completely precluded an energy trade relationship from being developed between Japan and the Soviet Union, and later with the Russian Federation. Despite the fact that Japan desperately lacked their own energy resources, mutually beneficial energy agreements like these have been reflexively squashed by the U.S. military and political rulers. Consequently, Japan was forced to adopt the nuclear power generation model across their four main islands — the most earthquake-prone piece of real estate on the planet. Welcome to FUKUSHIMA! The Real Reason America Used Nuclear Weapons Against Japan. It Was Not To End the War Or Save Lives. The Anglo-American Axis is represented, first and foremost, by the major English-speaking countries of the world: USA, UK, Canada, Australia, New Zealand and Israel. The European member nations of NATO, such as Germany, France, Italy, Spain, Portugal, Belgium, Luxembourg and the Netherlands are also closely aligned with the AAA as are all the Scandinavian countries. So are the Asia Pacific nations of Japan, South Korea, Taiwan and the Philippines. The World Shadow Government is a secret, supranational organization which completely controls the Anglo-American Axis, as well as the European Union, NATO, among many other institutional entities which constitute the Global Control Matrix.